در این پژوهش، گذر زمانی سانتونین-کامپانین بر اساس روزن‌بران شناور در 5 برش چینه‌شناسی الگو، روستای پادها٬ شوراب، روستای آبدراز و برش قره‌سو در خاور حوضه رسوبی کپه‌داغ مورد بررسی قرار گرفت. در تمامی برش‌های مورد مطالعه گونه جهانی Marsupites testudinarius Schlotheim که انقراض آن به طور گسترده در تعیین قاعده زمانی کامپانین به کار می‌رود یافت نگردید. چندین افق زیستی همزمان از روزن‌بران شناور نزدیک به گذر زمانی سانتونین-کامپانین شامل LODs گونه‌های Ventilabrella austiniana Cushman, Dicarinella concavata (Brotzen) , Dicarinella asymetrica (Sigal) و FOD گونه Contusotruncana patelliformis (Gandolfi) ثبت گردیدند. مرز زمانی سانتونین- کامپانین در بالاترین قسمت زیست زون Dicarinella asymetrica Total Range Zoneو در قسمت بالایی سازند آبدراز در برش‌های الگو، شوراب، روستای آبدراز و روستای پادها و در قاعده سازند آب تلخ در برش قره‌سو قرار دارد. 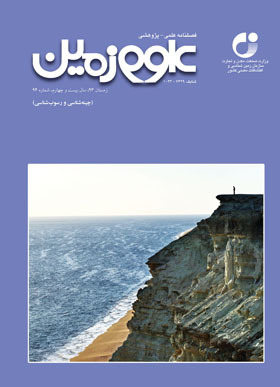 مدل زیستی به دست آمده برای برش‌های مورد مطالعه قابل مقایسه با مدلGale et al. (2008) در برش WDS (Waxahachie Dam Spill way Section) ، شمال تگزاس است. مطالعه آماری تجمعات روزن‌بران شناور و کف‌زی مشخص نمود که فراوانی پایین روزن‌بران شناور کیل‌دار و همچنین درصد پایین روزن‌بران شناور (%P) نشان‌دهنده شرایط محیطی کم‌ژرفا در برش‌های الگو، شوراب، روستای آبدراز و روستای پادها و فراوانی بالای روزن‌بران شناورکیل‌دار و نیز درصد بالای روزن‌بران شناور(%P) نشان دهنده شرایط ژرف در برش قره‌سو در بالای مرز سانتونین-کامپانین می‌باشد. همچنین نسبت روزن‌بران شناور به کف‌زی‌های سطح زی تعیین و با استفاده از معادلهواندرزوان مشخص شد که ژرفای آب در قاعده زمانی کامپانین به حدود 160 متر در برش قره‌سو رسیده است. In this research, we documented a paleontological study on the basis of planktic foraminifera, in five stratigraphic sections (Type, Padeha village, Shorab, Abderaz village and Qarehso) across the Santonian-Campanian transitional boundary in the eastern Kopeh-Dagh sedimentary basin. In all sections, no M. testudinarius Schlotheim (cosmopolitan species) was identified, which its last occurrence datum (LOD) is widely used to define the base of the Campanian stage. Several planktic foraminiferal biohorizons close to the Santonian/Campanian boundary were recorded, including the LOD’s of Ventilabrella austiniana Cushman, Dicarinella concavata (Brotzen) and Dicarinella asymetrica (Sigal), and the first occurrence datum (FOD) of Contusotruncana patelliformis (Gandolfi). The Santonian/Campanian boundary was placed in the upper part of the Dicarinella asymetrica Total Range Zone at the top of the Abderaz Formation in the type section and other sections in Shorab, Abderaz village, Padeha village, and at the base of the Abtalkh Formation in the Qarehso section. The acquired bio-models for the study sections are quite comparable with that of Gale et al, 2008 in WDS section, North Texas. On the basis of quantitative analysis of the planktic and benthic foraminiferal assemblages, the sparse presence of keeled planktic foraminifera and planktic foraminifera (%P) indicates that a shallow marine condition was prevailing just above the Santonian/Campanian boundary in the type section, Shorab, Abderaz and Padeha village sections. In addition, the abundance of such foraminifera (keeled planktic foraminifera and planktic foraminifera) reflects deeper water depths in the Qarehso section at the same time. Besides, estimation of the planktic to benthic ratio, which is based on the Van der Zwaan equilibrium, confirms that in the base of Campanian at one of the study sections (Qarehso section) the water depth was 160 m.